HELP! Most of the hardware portion of this system has been saved and seems to be functional. I have the "Crossbow" processor adapter and the system unit itself. What I don't have so far is the software and much of any idea as to how to make this system work. If you have the software for this computer, know what its original configuration should be or have any documentation, please tell me about it right away! I don't know how many of these are left, but I wouldn't bet there are too many out there. This is the first 6152 I have ever seen. It was sold alongside a few other units that were auctioned off separately. If you think you can help, please contact me here right away! Thank you! 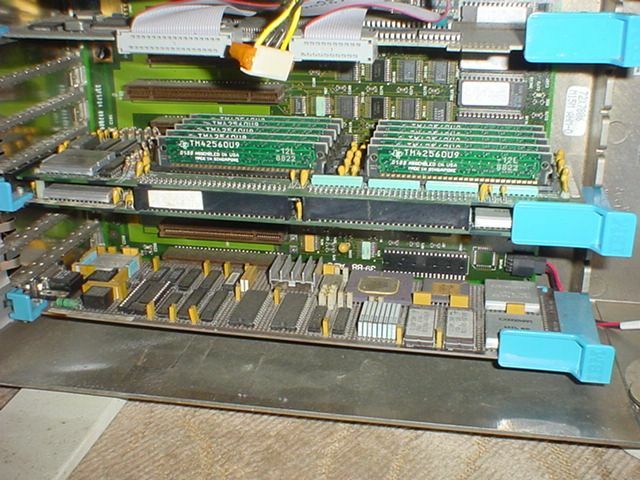 Click here to see a picture of the processor board in place inside the system unit. You can also click here to view (very) high resolution images of the board and its component parts. The IBM 6152 was a part of the IBM PC RT family of products. This system was offered for sale to academic and educational markets only, at least as far as I know. It is built around an IBM PS/2 Model 60 with a special add-on processor card located in one of the Microchannel expansion slots. So far this system has been tested to power up. That's as much as I can do with it so far. Since the hardware has been saved from fading off into oblivion, I would hope that the same can be done for any surviving software and documentation. If you happen to know of an application that was run on a 6152 Academic System, I would like to hear about it. Please use the contact information link above. The system I have claims to be a model 6152-022. It is serial number 72-4500457. 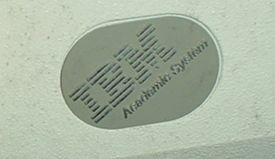 Oh, and then there is the special IBM medallion on the front of the system unit.